We are a leading Manufacturer of material handling conveyors from Pune, India. We are engaged in the manufacturing of latest Material Handling Conveyors that are used in the movement of fruits and vegetables. 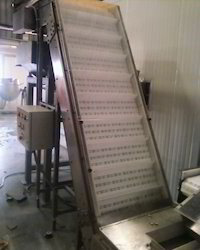 Our conveyors are specially designed for effective inspecting and conveying fruits and vegetables like mango, tomatoes, guavas, etc. Our company also customize the capacity according to the size of the operation. This also depends on the number of workers working there and their efficiency. The electric power usage also as per the capacity of the plant.